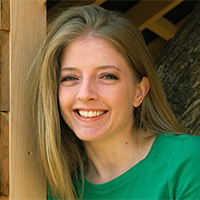 After studying Spanish and history at a small liberal arts school, Kate Hart taught small people their ABCs, wrote grants for grownup people with disabilities, and now builds treehouses for people of all sizes. She also blogs at YA Highway, makes the occasional infographic, and enjoys taking so many books out of the library that her children ask why people are staring. Kate’s debut YA novel, AFTER THE FALL (Farrar, Straus & Giroux – Margaret Ferguson Books, Fall 2016), is the story of a girl who refuses to play the damsel in distress, even in the face of sexual assault, and the boy who has always hoped to rescue her, until she seeks comfort in his brother’s arms and a terrible accident changes everything. Favorite books growing up: THE HEADLESS CUPID and LIBBY ON WEDNESDAY by Zilpha Keatley Snyder, any Calvin and Hobbes collection; later she loved THE STAND by Stephen King and THE HANDMAID’S TALE by Margaret Atwood. Favorite time of day/place to write: She’s most productive in weekend-long chunks, anywhere she can be alone. Books currently reading: BAD FEMINIST by Roxane Gay, A DISCOVERY OF WITCHES by Deborah Harkness. Favorite things to do (other than reading): Hiking, sewing, general craftiness, travel, concerts. Favorite sports teams: Oklahoma Sooners, Arkansas Razorbacks. Surprising personal fact: She’s a member of the Chickasaw Nation. Greatest thing about being a 2016 debut author: The opportunity to promote so many badass lady writers. That is an impressive childhood reading list! No wonder you have such an impressive debut novel! I can’t wait to read your book, Kate. Zilpha Keatley Snyder! Yes! Did you read “The Velvet Room”? Kate, you are a fascinating person and I’m sure your book will be just as fascinating.